Omar Bogle in action for Posh against Southend. Photo: Joe Dent/thgeposh.com. Manager Grant McCann is adamant Peterborough United fans will soon see the best of new signing Omar Bogle. 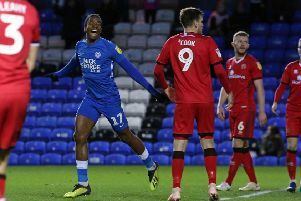 The on-loan striker, a million pound signing by Cardiff just over 12 months ago, delivered a disappointing debut in last Saturday’s (February 3) League One defeat at home to Southend. Posh boss Grant McCann is looking for a positive response from his players at Gillingham. But, after a full week’s training with the first-team squad, the 24 year-old is ready to show his true colours in tomorrow’s (February 10) League One fixture at Gillingham. Bogle started last week’s game as a strike partner for top scorer Jack Marriott in a 4-4-2 formation. It’s likely McCann will make a tactical switch for tomorrow’s game against a team who have moved up from next-to-bottom to 12th since Steve Lovell became manager. “I blamed myself straight after the game last weekend,” McCann stated. “The 4-4-2 formation is a difficult one to play. It needs every player to buy into the effort required to make it work and we didn’t do that. “But once the game starts the players are responsible and we didn’t do any of the things we worked on very well. Posh full-back Alex Penny faces a lenghty spell on the sidelines. “But you’re either winning or you’re learning and we must learn from that defeat and make sure we don’t lose two games in a row. We must respond well to the Southend game and I am confident we will. “We made things more difficult than it needed to be last week. We had Omar in the team and he’s 6ft 3, but he’s not a target man. We can’t fall into the trap like we did in the second half against Southend of hitting long balls in the hope a big man will get on the end of it. “Omar is not that sort of player. He’s like Jack Marriott insomuch he likes to run in behind defenders. We have to make sure we move the ball to create the spaces we can exploit. He’s quick and strong and now he’s had a full week with us he knows what we are about. He will be a good player for us. “Jack and Omar is a strike pairing of great potential. We are flexible in the way we can play though. “It’s a tough game tomorrow. Gillingham lost last week, but they are in good form generally. They have always had good individuals, but Steve (Lovell) has them playing well as a team. Midfielder Michael Doughty has recovered from illness and will return to the matchday squad, but reserves full-back Alex Penny has dislocated a shoulder and will be absent for a month at least. A couple of unnamed players are also recovering from knocks, while Danny Lloyd, Jack Baldwin and Junior Morias are all pushing for a starting place after strong midweek performances in the reserves. Posh won 3-2 at Mansfield for whom on-loan Posh striker Ricky Miller scored.